Regular yogurt’s thicker, creamier cousin is chock-full of protein and probiotics. It fills the belly, improves digestion, and bolsters the immune system. Plus, it’s a great healthy recipe substitute for sour cream, cream cheese, and even mayonnaise! Don’t worry; these berries won’t cause an oompa-loompa-like reaction. In fact, they’re nutritional superstars, filled with fiber, vitamin C, and cancer-fighting compounds. And studies suggest blueberries may even improve memory! Chia! Yep, this little seed is the same as those adorable little ceramic animal planters of the 90s! But don’t worry, the nutritious part is not the clay pot. Chia seeds are actually loaded with the most essential fatty acids of any known plant! Plus, one serving of the stuff is loaded with magnesium, iron, calcium, and potassium. High in fiber, antioxidants, and tons of other nutrients, this breakfast staple has been shown to help lower cholesterol levels, aid in digestion, and even improve metabolism . And it’s downright delicious— especially when flavored like pumpkin pie! This ages-old health secret has been used as a natural remedy for everything from cancer to heart disease ! The secret to this delicious drink? Antioxidants! The main superhero here is Epigallocatechin gallate, or EGCG, a phytochemical that slows irregular cell growth, which could potentially help prevent the growth of some cancers . This lean, mean, green machine is packed with vitamins, minerals, disease-fighting compounds, and the fiber essential in any diet. Though all members of the cruciferous vegetable family are super-duper healthy, broccoli stands out for its exceptionally high levels of vitamin C and folate (which can reduce risk of heart disease, certain cancers, and stroke) . Vitamin C is the superstar of this superfood. Just one cup of these red beauties satisfies the daily requirement for vitamin C (74 milligrams per day for women, 90 for men)! Studies suggest the antioxidant helps build and repair the body’s tissues, boosts immunity, and fights excess free radical damage. And the vitamin C in strawberries could help promote healthy eye function . This heart-healthy fish is packed with protein and a healthy dose of omega-3 fatty acids, which studies suggest may help reduce the risk of cardiovascular disease. And bonus points: Salmon may also protect skin from the sun and the damaging effects of UV rays . Surprise! 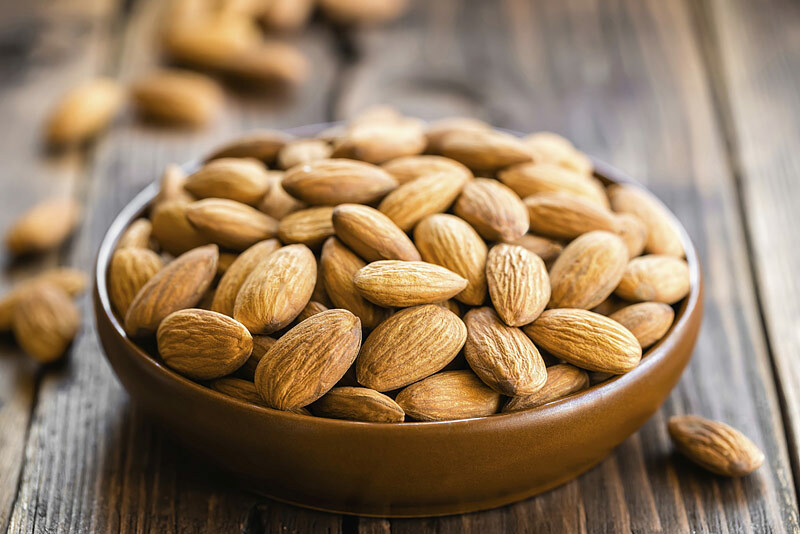 Almonds are the most nutritionally dense nut, meaning they offer the highest concentration of nutrients per calorie per ounce. For just 191 calories, a one-ounce serving provides 3.4 grams of fiber (that’s about 14 percent of the daily recommended value) and a healthy dose of potassium, calcium, vitamin E, magnesium, and iron. Plus, you can eat them as BUTTER! This all-star veggie contains tons of vitamins, minerals, and antioxidants that can help fight disease and strengthen vital organs. And their purple hue may be the secret to their healthy success— some studies suggest betalains, the purple pigments in these veggies, may help ward off cancer and other degenerative diseases . High in protein and low in cholesterol, beans of any variety can add a healthy twist to any dish (even brownies!). They’re also loaded with fiber, folate, and magnesium, and studies have shown that legumes (like beans) can actually help lower cholesterol and reduce the risk of certain cancers (at least in rats…) . Loaded with antioxidants and vitamins, these gourds aren’t just for carving (or making into pie). The star nutrient here is beta-carotene, a provitamin that the body converts to vitamin A, which is known for its immune boosting powers and essential role in eye health . Say it with us, people: “Fiber is good.” And apples are a great low-calorie source. (A medium-sized apple weighs in at under 100 calories.) Plus, upping apple intake has been associated with reduced risk of cardiovascular disease, certain cancers, diabetes, and asthma . It’s time to work these fall favorites into dishes year-round. Whether it’s in the shape of a can or fresh off the stove, cranberries have a handful of health benefits and disease-fighting powers . These bacteria-busting berries can help fight inflammation, reduce the risk of heart disease, improve oral health, help prevent ulcers and yeast infections, and may even inhibit the growth of some human cancer cells . Yes, it might leave breath less-than-desirable, but these cloves can do more than flavor— they’ve been used for centuries as food and medicine. These days, garlic is used to treat anything from high blood pressure and heart disease to certain types of cancer. Plus, studies suggest garlic extract can be used to treat yeast infections in women and prostate issues in men . While all the vitamins and minerals are a great bonus, the real star here is cauliflower’s cancer-fighting compounds, glucosinolates. These phytochemicals are responsible for cauliflower’s sometimes-bitter flavor, but they have also been shown to prevent damage to the lugs and stomach by carcinogens, potentially protecting agiainst those cancers . And thanks to interactions with estrogen, cauliflower may also help prevent hormone-driven cancers like breast, uterine, and cervical . Leeks owe many of their anti-cancer superpowers to their organosulphur compounds. These nutrients have been credited with everything from kicking cancer to boosting immunity . Studies also suggest leeks could help protect the digestive system from stomach and gastric cancers . They’re pretty cheap, easy to prepare, and high in protein, iron and other essential nutrients. Need we say more? The iron may help fight off anemia (a condition that’s especially common among vegetarians and vegans), and they’re low on the glycemic index, too. That means they cause blood sugar to spike less quickly than other starches, so our energy lasts longer .